If you can read, you can cook. Here I am with my first place ribbon at the annual Sage Brush festival, with a special hug from then-President of the Greater Granby Area Chamber of Commerce, wonderful, Patty Peterson. Cover a cookie sheet with non-stick aluminum foil. Combine the sugar, corn syrup, peanuts, and cinnamon in a large, clear microwave-safe bowl. Cook for ten minutes, stopping every two minutes to stir the mixture. It will be very hot so wear oven mitts. At the end of the ten minutes, stir in the butter, vanilla, peanut butter and baking soda. Pour onto the waiting cookie sheet. Cool. Break into pieces. Enjoy or give away. Spread the prepared Graham cracker crust with warmed fudge ice cream topping. Take 1 cup of the chopped pecans and place on top of the fudge on the bottom and sides of the unbaked pie crust. Sprinkle the teaspoon of cinnamon on the pecans. In a separate bowl, beat the eggs, honey, syrup, chopped pecans & chocolate bits & EVOO (Extra Virgin Olive Oil). Pour the mixture into the pie crust top with the cup of whole pecans. Bake in 350 degree oven for 40-45 minutes until you can insert a sharp knife or long tooth pick and it comes out clean. Cool and serve and listening to the oohs and aahs. Recipe/Photo Note: This dessert was so popular at our local Sagebrush festival that the judges ate the second pie we were supposed to auction off. 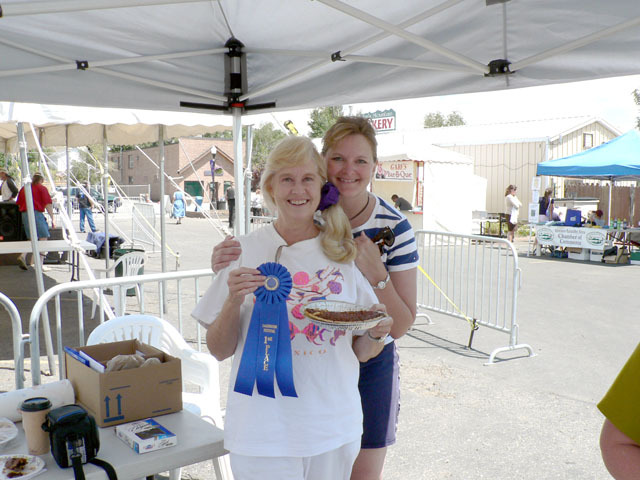 The Turtle Candy Pie also won Grand Champion Pie at the 2018 Middle Park Fair & Rodeo Mayor’s Pie Contest!